We’d love your help. 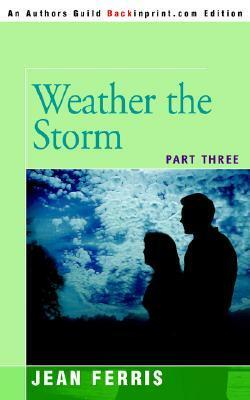 Let us know what’s wrong with this preview of Weather the Storm by Jean Ferris. To ask other readers questions about Weather the Storm, please sign up. I loved this series when I was young, and am still enjoying them now! It's a mostly annual summer read for me. I just love all the characters and almost find it hard to say goodbye each time I finish the series. Love the series. The only critique I would have is how fast the Captain Lawrence storyline wraps up. I think there should have been more. But still good! My friends teenage daughter told me to read these, and I really loved them. Not to much! Good happy ending. Some good adventure. Good moral close to the story. Quick read. I loved this series. I totally fell in love with the characters. I wish there was a movie. It would be perfect to keep me entertained while I lounge around on bed rest in a couple weeks. Yep, loved this one, too. Great ending to the series. Ah, memories. this is the final book in the rosie/raider trilogy. Again- I cannot explain why I loved these so much when I was younger. GREAT ending to a cute series.